Thank you for all the time and effort you put into making Wet Web Media the wonderful resource that it is. For the past 5 years I have had a female Dovii living by herself in a 125 gallon. For the first 4 years I never even saw her. She has only begun getting over her shyness in the past year or so. Still, she is very timid. Even while caring for eggs, which is nearly non-stop, she doesn't show any aggression to the siphon or my hand while I am doing tank maintenance. I've accepted that is just the way she is, and I'm fine with that. My concern is with the female Jack Dempsey I acquired ten months ago. I picked her from the store tank because she was front and center, seemingly relaxed, and with an outgoing personality. She remained that way at home--the only resident in a 75 gallon--for several months. As much as I love my Dovii, I was relieved that the Dempsey did not have the same reclusive personality. Three months ago I changed the Dempsey's substrate from gravel to a mix of gravel and play sand. From that moment on she has been terrified. The sand was, of course, pre-washed and I closely monitored the water parameters throughout the week following the substrate change for any ammonia spikes. There were none. The values then, as they are now, were consistently Ammonia-0/Nitrite-0/Nitrate-0/pH-7.4. This is the same sand that I use in five of my other tanks without problem. The tank is planted and heavily decorated with lots of hiding spots, and the layout is exactly the same as it was before I changed the substrate. I tried adding more plants to see if that would help her feel more comfortable but it didn't work. The substrate is lighter in color than before but not by much, as there is still quite a bit of the old gravel mixed in. I thought she would settle down with time but that has not been the case. She spends all day hiding under a pot in the corner and, if you get near the tank, she darts and bashes herself into the sides or top of the tank. My Dovii is shy; my Dempsey is spastic. I'm saddened that she's not the same outgoing fish she used to be (and that I now have two large tanks that look empty), but I'm more concerned that she is feeling constantly stressed. So now I'm wondering if adding more fish to the tank would help her. This is where I need some advice. Would you recommend adding another cichlid of similar size (4-5 inches)? <No. Cichlids aren't dither fish. Dither fish are specifically open water, surface swimming, schooling fish such as tetras, barbs, minnows, etc. Choose according to the types of fish. In a big tank, Swordtails might work with Central American cichlids, or Mexican Tetras (Astyanax spp.) but there's always a risk of cichlids attacking them, so do keep a close eye. Which kind(s) might be a good option for this 75 gallon tank? Or, should I try some sort of Dither Fish? Again, what kind(s) would you recommend? Giant Danios come to mind, but those don't exactly thrill me. <But they are cheap, colourful, and very fast. Silver Dollars and Silver Tetras can be good, so can the bigger barbs such as Spanner Barbs. I've been hesitant to add more fish to her tank out of fear that she will suddenly become very aggressive and I'll have to move the new fish out--or worse, the new fish is/are aggressive towards her. I have eight tanks in total, but few back-up options for where I could put a new cichlid or school of dithers. Setting up a new tank for "failed-experiment fish" is not really feasible so they would have to fit in somewhere, whether it be with the Dempsey, the Dovii, or with my 14" Oscar and two Synodontis cats. (Water parameters are the same as above for all my tanks.) The Oscar is rather placid but, only being a 75 gallon, I feel that tank is already crowded. Returning the new fish might be an option if the store allowed it, but I would like to avoid that, if possible. I know there are no compatibility guarantees when it comes to fish. I am just hoping you may have some suggestions that you feel fairly confident about. First of all, thanks again for your great site and the incredible information you put out. I have a Blue Acara and a Green Terror cichlid that have recently started a daily ritual which is a bit confusing to me. They have cohabitated in the same tank (37 Gallons) for almost a year along with a 6" Green Severum and have not done much more than the occasional chase behavior. Recently they have started a mouth locking that ends up in a spiral circling of each other after which they retreat to their separate places in the tank and ignore each other for either the rest of the night or a few hours. It was my understanding (based on my research) that these are both female fish. I was under the impression that since they are different breeds, even if they are different gender, they wouldn't spawn so I am leaning towards territorial behaviour. They each have a hiding spot and both have been the size you see in the picture for some time. Could you help me determine what is going on? That will help me know how imperative that it is that I get a larger tank or what. Recently my Jack Dempsey, Texas Cichlid and blood parrot have started hiding a lot and are very jumpy. They are scared to go to the top of the tank for food and will only eat if the food is dropped in front of them. I have tried feeding them different foods like earth worms, Cichlid pellets, peas and meal worms which they eat but didn't have much affect. The PH is 7 and the acidity is neutral. The tank is 40x16x16 (inches) which I am upgrading when they get bigger. <That's 168 litres, or about 44 US gallons -- not nearly enough for this fish. 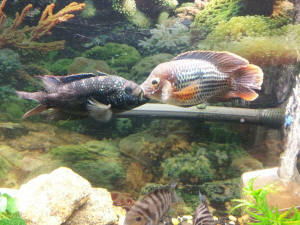 Do please understand how aggressive JDs and Texas cichlids become. If you could give me any advise it would be highly appreciated. 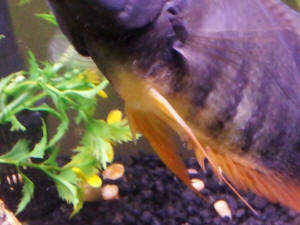 My Blood Parrot is 5 inches, my Texas is 4 inches and my Jack Dempsey is 7 inches. I have had them since they were all 2 inches and they get along fine. I have tested the nitrites are at zero and nitrates are around 15 ppm. I have been doing 50% water changes all week to see if they would improve and there colour has came back but no change to there behaviour. What size tank would you recommend? I cant have anything that is longer than 4ft due to space and I have been looking at a 4x2x2 foot tank. would that be suitable? Also before they started acting like this, my Blood Parrot and Texas used to pair and both have eggs. They are both females and would both guard the eggs but after a few days would eat them. Is this normal behaviour? I have realised that my lights must be to bright because when I turn them off they come out of there hiding places and start acting how they used to! So what could I do so I don't have to have the lights off all the time? <Make friends with a clump of floating Indian Fern, Ceratopteris thalictroides. Does the job wonderfully! For some reason English pet shops rarely carry the stuff, but you can easily buy a clump online and it'll grow in no time at all. I've got the stuff in all my tanks. It is sometimes sold in pots but it doesn't really like to be grown that way. Uproot potted specimens and let them float. Do note that the floating form has broad leaves, while the out-of-water form has thinner leaves more like a fern. Thanks again for your help it is very appreciated! Hi, I recently bought a 3 inch Flowerhorn which I have kept along with a pair of 3 inch green terrors. They are doing quite fine together and do not seem to be fighting at all. I also have a pair of 1 1/2 inch blue morphs which seem to be dominating the 3 inch green terrors!!!!!!! The problem I am having is that the terrors were always scared of me and used to go into hiding as soon as I came near the tank. Now the FH follows them every time they go hide and so I don't get to see any of them. What do you suggest I do? Secondly, I read in one of your threads that a FH gets its hump when it reaches 8 inches or so but recently I visited a shop where they were selling a 2 inch FH with an amazing hump and it was priced at 3000 Indian rupees!